Cleveland Area History: What Lurks Behind The Trees? What Lurks Behind The Trees? 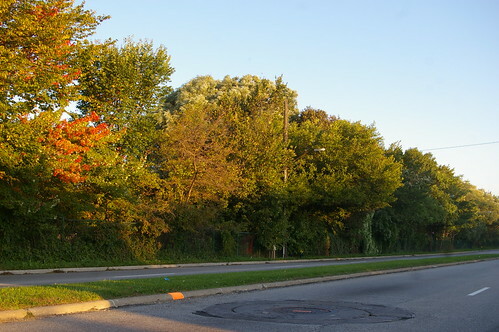 If you've driven down Warrensville Center Road in Cleveland Heights and South Euclid, between Cedar and Mayfield, you've probably noticed this long, dense row of trees on the west side of the road, affording only the occasional glimpse of the golf course that they obscure. Hidden behind the trees is the Oakwood Club, which closed last year. It's the center of a controversy between proponents of redevelopment and those who favor the preservation of green space - but this isn't the venue for that fight. Today, I'll share a brief history of the club - the first major Jewish country club in the Cleveland area. In coming days, image rights permitting, I hope to delve into the ornate interior of the historic clubhouse. 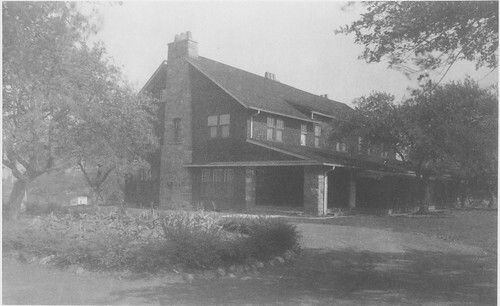 The primary source on the history of the Oakwood Club is Oakwood Club, 1905-1980, by Barnett Bookatz. Many of the facts quoted here are derived from that publication. From Art work of Cleveland - 1911, used courtesy of Cleveland Public Library. Oakwood was founded in 1905, by L.J. Wolf, Morris A. Black, Edward M. Baker, Hascal C. Lang, and M.J. Mandelbaum. The first golf course - 9 holes, designed by Arthur Boggs - opened the following year. 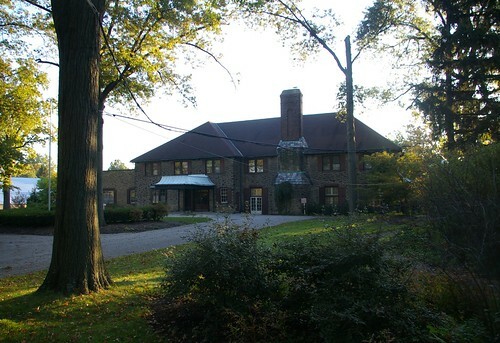 In 1906, Frank B. Meade, a notable Cleveland architect, designed this clubhouse, expected to cost $15,000. 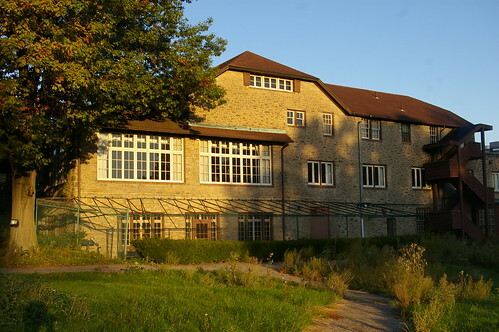 The structure, built by Gick & Fry, was completed in 1907. It was either a complete remodel of the existing structure (Bookatz) or a new one (Plain Dealer, February 4, 1906, page 27). The new features included the grillroom, a men's locer room with 69 double-deck lockers, a "bath-room" with three showers, a double washstand and three lavatories. the first floor held the large living room and dining room, a "Ladies Parlor" witih 20 double-deck lockers, a shower and a bath. Along the entire length of the building ran a 72-foot long porch. Detail, Plate 4, Plat book of Cuyahoga County, Ohio, 1914, courtesy of Cleveland Public Library. It's worth noting that, at the time, the club had much less land than it does today. 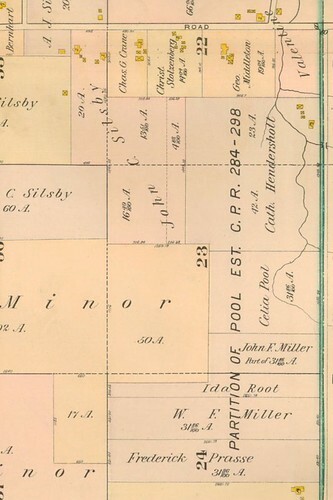 Their holdings, 19 acres, can be seen near the center of this 1914 map. As it is today, the club includes almost 150 acres - most of area shown on this map as undeveloped. Note the presence of a house and related structures on the parcel owned by the Citizens Saving and Trust Co. The house was located at the end of a long driveway - the double dashed line in pink - the site of the current clubhouse. Some of the outbuildings may remain, repurposed as service structures. Detail, Plate 10, Atlas of the Suburbs of Cleveland, Ohio - Flynn, 1898, courtesy of Cleveland Public Library. 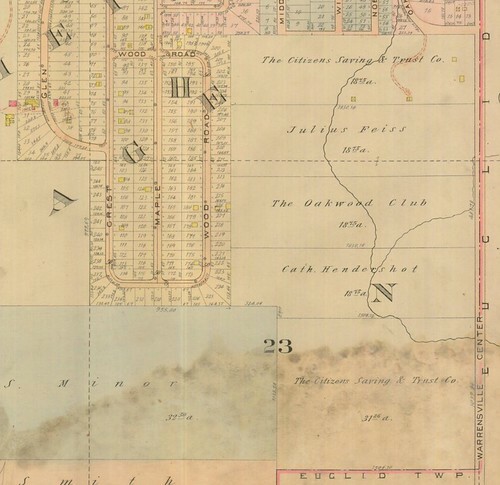 This 1898 map shows a different configuration of the structures on the property, owned at the time by Catherine Hendershot. A house is present - the yellow box closest to the right side of the image on Hendershot's property. Why does this matter? 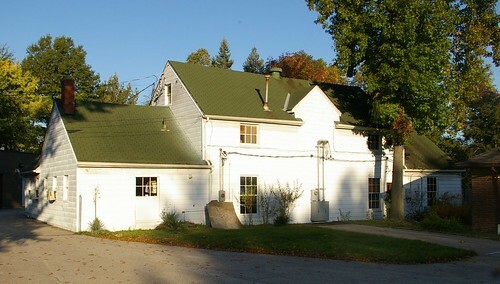 Because it tends to suggest that this building, now used as a garage for machinery, may, in fact, be the house that was on the property before the country club was built. All interior detail that might suggest the age has been lost, as shown in these photos. A second nine hole golf course, designed by Chicagoan Tom Bendelow, was completed in 1915. In 1929, the course was redesigned, as the widening of Warrensville Center Road consumed some of the eastern edge of the course. It remained in this configuration until a redesign in 1972-1973. The Excelsior Club merged with Oakwood in 1930. The increase membership necessitated building a new clubhouse. The building, completed in 1931, was designed by George B. Mayer of Charles R. Greco & Associates. Louis Rorimer, of Rorimer-Brooks Studios, was responsible for the interior decoration. The architectural detail of the clubhouse, which appears to have been expanded several times over the years, is of high quality. This wrought iron and copper awning protected visitors from the elements as they entered the club. Details of similar quality continue around the entire structure, as seen here on the south wall. 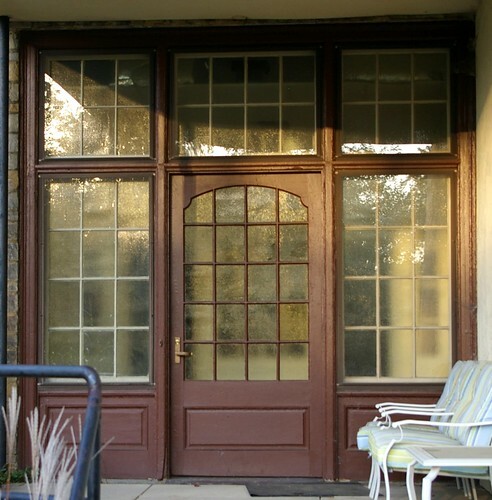 Even the little details, like this doorway on the east side of the clubhouse, are well-proportioned and pleasing. The east side of the clubhouse, seen here, faces Warrensville Center Road. 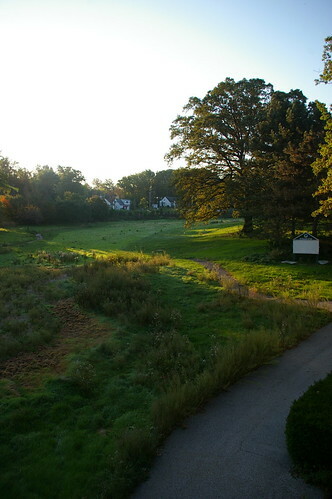 I'll close with this view from the clubhouse, looking southeast toward Warrensville Center Road, the early morning sun hitting the now unmanicured greens. In future posts, I hope to address the history of the grounds in more detail, and give you a peek into the clubhouse, providing that I am able to obtain permission to use the images I need. If you have photographs or stories relating to the Oakwood Club, please contact me to share them. It is amazing how this little oasis could have survived just behind busy Warrensville Center Road--although I understand that its future is now in extreme doubt. 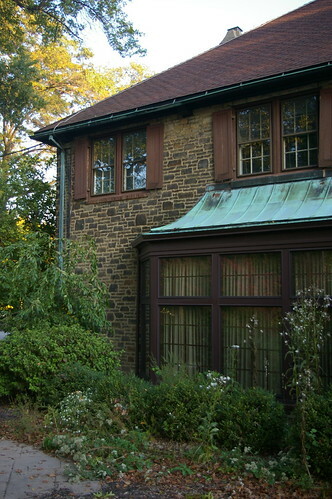 Help Save an Important Historic Home! Cleveland Nightlife in the 1930s?